Most of Carnival Valor's dining is included in the cruise fare -- even the new specialty restaurants, Guy's Burger Joint and BlueIguana Cantina, whose quality could easily warrant a surcharge. With the two additions, as well as upgrades to its buffet, the ship serves up enough variety to keep your taste buds satisfied throughout your cruise -- with the option to splurge on a juicy prime rib or Maine lobster, if you wish. Washington Dining Room (Decks 3 and 4, aft) and Lincoln Dining Room (Decks 3 and 4, forward): Following the American history theme, Carnival Valor's two main dining rooms not only share presidentially inspired names, but also nearly identical layouts: Art Deco design; muted pink color scheme with pops of bright coral, gold and white; walls of windows; and ornate chandeliers. The only difference is the size; Washington seats 1,122 while Lincoln has capacity for only 744. For dinner, you can choose to eat in the Washington Dining Room, at the same table, every night at 6 p.m. or 8:15 p.m. -- or you can opt for "Your Time Dining," arriving in the Lincoln Dining Room anytime between 5:45 p.m. and 9:30 p.m. The Lincoln Dining Room also offers the same set dining times. Wait times depend on when you show up, how many are in your group and if you want your own table. You can limit the time in line by arriving early and opting to sit with fellow passengers. The menu is divided into two groups: dishes that are available every day -- such as a Caesar salad, southern fried chicken and steakhouse selections that are available for an extra charge -- and items that change daily. The rotating menu includes appetizers, one "Didja" (did you ever …) dish described as "food you always wanted to try, but did not dare" and entrees. Dinners were consistently good, but nothing "out of this world." Our only gripe was the portion sizes; the lobster ravioli was clearly designed for a light eater, while the roasted duck looked like it could have fed the entire table. We recommend asking your waiter about portion sizes before you order. Those with larger appetites also can double up on portions or appetizers. Rotating appetizers usually include a hot soup and chilled soup every night, as well as a salad and heartier dish, like chicken tenders. Of course, we ordered the "Didja" dish in addition to our appetizer every night. They were hit or miss; the alligator fritters were delicious, but the cured salmon with candied tomato … not so much. We appreciate the inventiveness, though. Meanwhile, popular entrees include linguini with Italian sausage, pan-seared tilapia and meatloaf. You can also select from a variety of sides, ranging from steamed veggies to baked potatoes with sour cream and chives. Items containing nuts or soy are noted on the menu. Those with special dietary requirements must make special arrangements with their maitre d' in advance. Separate dessert and wine menus are available for those who are interested. The wine list includes a variety of reds and whites, with a few sparkling and rose options. There's also a section titled "Gifft Wines," which features Carnival partner Kathie Lee Gifford's own chardonnay, red blend and rose. For dessert, you can order a cheese or fruit plate, choose from various flavors of sorbet and ice cream, or -- if you're a chocolate lover -- just skip reading the menu and order the warm chocolate melting cake (trust us on this one). Breakfast (open seating) is served in the Washington Dining Room daily, from 7:30 to 9:30 a.m. -- except on sea days, when Carnival's SeaDay Brunch is open from 8:30 a.m. to 1 p.m. Menu items include huevos rancheros (eggs on tortillas, topped with salsa), corn flake-crusted French toast and loaded mac 'n' cheese. Lunch is not offered in either of the main dining rooms, although on sea days, the Washington Dining Room opens for Carnival's Tea Time, from 3 to 4 p.m.
Rosie's Restaurant (Deck 9, aft or midship): Rosie's, the ship's Lido buffet, serves breakfast, lunch and dinner as well as after-hours munchies. Themed with tile mosaics that depict WWII's Rosie the Riveter and working women wearing hard hats and handling blowtorches, Rosie's provides ample seating indoors, as well as tables outdoors near the pool. It includes the Breakfast Grill, which is packed from 7:30 to 10:30 a.m., Chef's Choice (different themed bites served each day from noon to 2:30 p.m.) and Sweet Spot dessert station and a number of specialty stations. Note: A late-risers breakfast buffet is served from 9 a.m. to noon. Items are pretty basic and include pancakes, bacon and eggs Benedict for breakfast; salad, ribs and sauteed vegetables for lunch; and penne mariscos, meatloaf and pasta for dinner; chocolate cake, Jell-O and lemon cupcakes for snacks. The food was mediocre for the most part; we found some dishes to be somewhat flavorless. Seating can be hard to find during breakfast and lunch hours; you'll have better luck finding an open table toward the back of the buffet, upstairs near Fish 'n' Chips and around the aft pool. Guy's Burger Joint (Deck 9, midship): The poolside grill developed by Food Network personality Guy Fieri serves up some of our favorite burgers at sea from noon to 6 p.m. Choose one of six meat patties with a side of hand-cut fries, and dress it to your liking at the toppings bar, with basics like lettuce and tomato, heavier flavors ranging from sauteed onions to bacon crumbles, and a variety of sauces (we recommend the chipotle mayo). There was always a long line for Guy's on our cruise, but it's well worth the wait. Veggie burgers are available upon request. BlueIguana Cantina (Deck 9, midship): On the other side of Guy's Burger Joint, the BlueIguana Cantina serves made-to-order burritos and tacos for breakfast (7:30 to 10:30 a.m.) and lunch (noon to 2:30 p.m.). The burrito station was the more popular of the two on our cruise. Start by selecting a wheat or jalapeno wrap and a main filling (steak, chicken or shrimp for lunch and chicken sausage, ham or scrambled eggs for breakfast), then stuff it with as many ingredients as you like. Tacos are more grab-and-go; choose between chicken, fish or pork, and finish it off at the salsa bar. The salsa bar includes standard toppings like Monterey Jack cheese, onions and cilantro as well as more unique options such as watermelon and jicama sauce and black bean and corn. There's also a variety of hot sauces and fresh watermelon slices. Mongolian Wok (Deck 9, aft): The popular lunch-only Asian buffet station lets you select vegetables, noodles, meats, seafood and poultry for servers to stir-fry. You can also add more flavor with one of three sauces: black bean (mild), Thai barbecue (medium) or Szechwan (hot). Expect massive lines on sea days. Fish 'n' Chips (Deck 10, aft): Contrary to the name, Fish 'n' Chips does not limit itself to English pub-style cuisine. The buffet station (you'll find it on the second level of the buffet all the way at the back), open from noon to 2:30 p.m. for lunch, serves up small, shareable portions in addition to heartier options like the classic fish and chips. Menu items include ahi tuna with watermelon, Cajun-barbecued octopus salad, ceviche and fried oysters. Carnival Deli (Deck 9, aft): Open from 11 a.m. to 11 p.m., the Carnival Deli offers made-to-order wraps, sandwiches and bagels -- with both cold and hot selections. Options include tuna salad on white bread; smoked salmon on a bagel; and arugula, roasted peppers and mozzarella on focaccia. Pizza Pirate (Deck 9, aft): The Pizza Pirate is a night owl's best friend, as it's open 24 hours. Satisfy your craving any time of day with thin-crust slices such as pepperoni, margherita and prosciutto. Gluten-free pies are available by request. Soft Serve & Froyo (Deck 9, midship): This self-serve ice cream station allows you to swirl chocolate or vanilla custard, or flavored frozen yogurt (there's an option to mix with custard), into a cone or cup. Open 24 hours. Room Service: Carnival offers a continental breakfast, free of charge. The menu allows you to pick and choose as many items as you want from different sections: fresh fruit or smoked salmon, cereals, breakfast breads, yogurt, hot and cold beverages and condiments. Our fruit was a bit under-ripe, but the croissants were soft and fluffy, and paired perfectly with a cup of coffee on our balcony. Carnival also offers a handful of room service meals a la carte, available 24/7. They include chicken wings ($5), spicy fried firecracker shrimp ($6), Cobb salad ($4) and chicken quesadilla ($5). 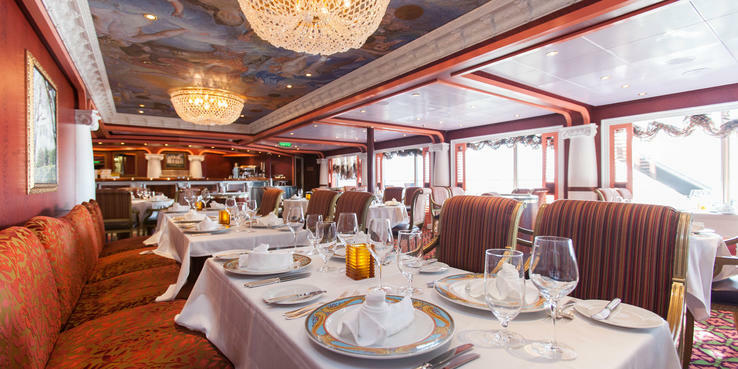 Chef's Table (Deck 3, midship); $75: The Chef's Table is an exclusive dining experience for only 14 passengers. Hosted by the ship's master executive chef, it includes cocktails and hors d'oeuvres, a multicourse dinner with dishes not found on any other menu and a galley tour. It's held once per cruise in the Betsy Ross Room. Java Cafe (Deck 5, midship); a la carte: When coffee in the buffet or main dining room just doesn't cut it, head to the Java Cafe. The retro space serves up specialty iced and hot coffee as well as a variety of cakes and gelato. Green Eggs and Ham Breakfast (Deck 5, aft); $5: Part of Carnival's Seuss at Sea family program, the Green Eggs and Ham Breakfast is held in the Washington Dining Room once per cruise (typically on a sea day). All ages are welcome to join, and reservations are recommended. During the breakfast, the dining room is decked out in Dr. Seuss-inspired decor while characters such as the Cat in the Hat, Thing One and Thing Two and Sam-I-Am make the rounds. Menu items include Truffula Tree Pancake stacks, Horton's Cereal-Crusted French Toast and Fox in Socks Steak and Eggs. Sushi at Sea (Deck 9, aft); a la carte: This sushi counter was added to Rosie's lido buffet in 2017. On offer are four sushi or sashimi options for $1.50 a piece, as well as rolls for either $5 (California or spicy tuna) or $7.50 (bang bang bonsai or tempura) apiece. Diners place their order at the counter, are given a pager and then paged when their order is ready. Scarlett's Steakhouse (Deck 10, aft); $38: Carnival Valor's only for-fee specialty restaurant is a must for date nights and celebrations, thanks to its intimate ambiance, higher quality dishes and more personalized service. Reserve ahead, and be prepared to pay $38 per person for a four-course dinner that includes an appetizer, salad, entree with sides and a dessert. We fell in love with the beef carpaccio (the truffle oil was a nice touch) and ahi tuna tartare -- both several classes above the appetizers served in the dining room. The entrees also were quite impressive, though again, we recommend inquiring about portion sizes before you order. Diners also are treated to chef's compliments, courtesy of the theater-style kitchen; the night we went, it was a delicious charred salmon and chilled tomato soup. Wines and cocktails are available, as is dessert, which ranges from caramelized apples to a chocolate sampler.